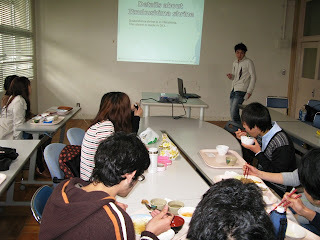 The third speaker of the Lunch Presentation Meeting was a sophomore at the Faculty of Agriculture. His English-Japanese presentation started off with a definition of 'World Heritage Sites'. He followed up with some examples of world heritage sites in China and Korea and he asked the audience about the number of world heritage sites Japan has. 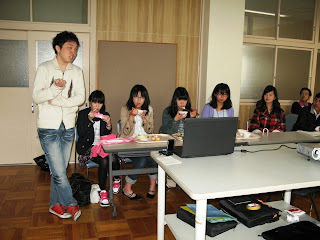 Ryo then went on to focus on two sites which are closely Kagawa. They are Himeji Castle in Hyogo Prefecture, and Itsukushima Shrine in Miyajima Island, Hiroshima. 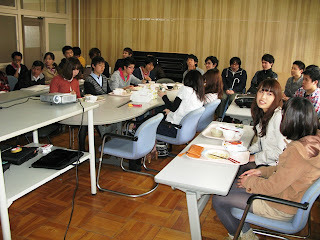 Thirty one students (12 international and 19 Japanese) participated in today's talk. Two announcements were made: (1) students shall moderate the next session onwards and (2) we shall be presenting a Certificate of Appreciation to all speakers.